Uma Lakshmipathy is a Principal Scientist at Life Technologies. She has a PhD in life sciences, with academic and industry experience in molecular biology and stem cells. Dr. Lakshmipathy holds two patents and has authored over thirty publications. Jonathan D. Chesnut is an R & D Director at Life Technologies, where he heads the stem cell engineering group. He holds five patents and has authored over twenty publications. Bhaskar Thyagarajan is a Program Manager at Life Technologies. He has a PhD in pharmacology, with expertise in the areas of molecular biology, DNA recombination, gene and cell therapy, and protein purification. He holds one patent and has authored over twenty publications. 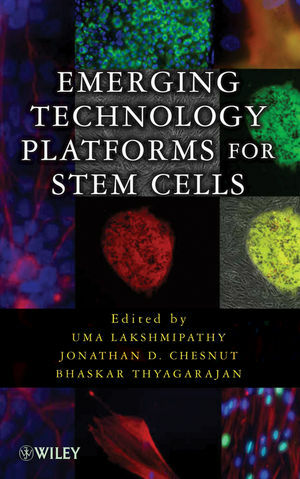 Foreword Current state of stem cell field: Overview (Mahendra S. Rao). Chapter 1: Derivation methods for human embryonic stem cells: Past, present & future Necati Findikli. Chapter 2: Isolation of human ESCs from various stages of the human embryo (Yuri Verlinsky, N. Strelchenko, V. Kukharenko, A. Shkumatov, S. Rechitsky, O. Verlinsky, and A. Kuliev). Chapter 3: Derivation of stem cells from epiblasts (Michal Amit). Chapter 4: Derivation of Embryonic Stem Cells from Parthenogenetic Eggs (Jose Cibelli). Chapter 5: Reprogramming Developmental Potential (Costas A. Lyssiotis Cradley D. Charette, and Luke L. Lairson). Chapter 6: Adult stem cells and their role in endogenous tissue repair (N. Sachewsky and Cindi Morshead). Chapter 7: Greater differentiation potential of adult stem cells (Carlos Clavel and Catherine Verfaillie). Chapter 8: Cancer stem cells (Scott Dylla, In-Kyung Park and Austin L. Gurney). Chapter 9: Large scale production of adult stem cells for clinical use (Kristin Goltry, Brian Hampson, Naia Venturi and Ronnda Bartel). Chapter 10: Genetic and epigenetic features of stem cells (Jonathan Auerbach and Richard Josephson). Chapter 11: Directed differentiation of embryonic stem cells (Marjorie Pick). Chapter 12: Identification of signaling pathways involved during differentiation Takumi Miura. Chapter 13 Media and extracellular matrix requirements for large scale ESC growth (Allan J. Robins and Tom Schultz). Chapter 14: Automated method for culturing ES cells (S. Terstegge and Oliver Brustle). Chapter 15: Quantitative 2D Imaging of Human Embryonic Stem Cells (Steven K.W. Oh, Allen K. Chen, Andre B.H. Choo and Ivan Reading). Chapter 16: Nanobiotechonology for stem cell culture and Maintenance (Minseok S. Kim, Wonhye Lee and Je-Kyun Park). Chapter 17: Engineering Microenvironments to Control Stem Cell Functions (Anielle An-Chi Tsou and Song Li). Chapter 18: Improved lentiviral gene delivery tools for stem cells (Sanjay Vasu, Jian-Ping Yang and Wieslaw Kudlicki). Chapter 19: Sleeping Beauty-mediated Transposition in Stem Cells (Andrew Wilbur, Jakub Tolar, Bruce R Blazar, Catherine M Verfaillie, Uma Lakshmipathy, Dan S Kaufman and Scott McIvor). Chapter 20: PhiC31 Integrase for Modification of Stem Cells (W. Edward Jung and Michelle Calos). Chapter 21: Cell Engineering using Integrase and Recombinase systems (Takefumi Sone, Fumiko Nishi, Kazuhide Yahata, Yukari Sasaki, Hiroe Kishine, Taichi Andoh, Ken Inoue, Bhaskar Thyagarajan, Jonathan D. Chesnut and Fumio Imamoto). Chapter 22: hESC derived cardiomyocytes for cell therapy and drug discovery (William Sun and Robert Zweigerdt). Chapter 23: hESC in Drug discovery (Catharina Ellerstrom, Petter Bjorquist, Peter Sartipy, Johan Hyllner and Raimund Strehl). Chapter 24: Characterization and Culturing of Adipose-Derived Precursor Cells (Dietmar Hutmacher, Joanna Olkowska-Truchanowicz, David Leong, Johannes Reichert and Thiam Chye Lim). Chapter 25: Bringing Mesenchymal stem cells to clinic (Robert Deans).